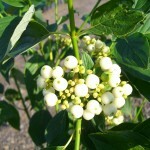 A fast growing, upright rounded shrub with clusters of small white flowers in the spring. The stems are bright yellow in the winter, with good disease resistance. The leaves are small and green. It is adaptable to most soils and full to part sun. 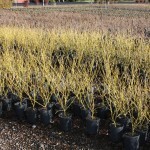 Use in mass plantings or as an informal hedge. Prune to remove older stems and encourage new growth. A good substitute for the disease prone C. s. flaviramea.